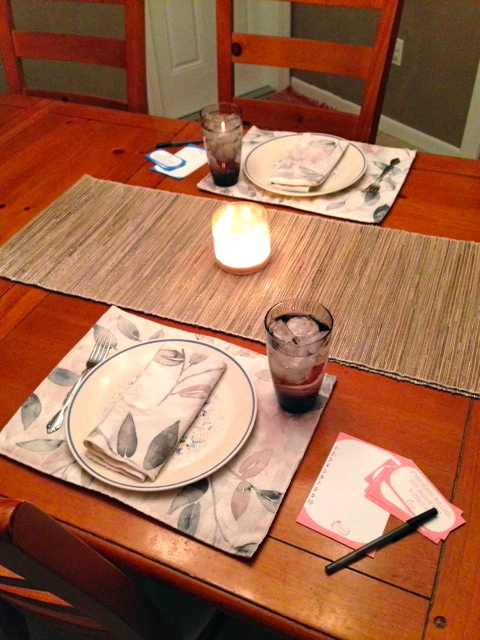 In an attempt to avoid date nights that after 12 years together seemed to evolve into Order-Takeout-and-Sit-on-the-Couch-While-Watching-Dumb-TV-Shows, Jay and I have begun to implement regular at-home Date Nights that focus on being together and connecting with each other. We weren’t sure if it was going to work out… after all, old habits die hard. But the first one we tried was so successful (we created our bucket lists together), we decided to give it another go. And this time, it was my turn to come up with the conversation-inducing activity. I hit up Pinterest for fun date night ideas, and stumbled across a free printable for The Newlywed Game, courtesy of the Dating Divas (I highly suggest you check out their site – www.thedatingdivas.com). I realize that being married for 12 years pretty much disqualifies us for the TV show version, so I though this might be a fun alternative. We sat in silence for the beginning of dinner as we wrote down our answers, then as soon as we finished we dove into both our meal and our game. We discussed keeping score, but in the end decided that was a bad idea since it would be all too easy to be offended if we hadn’t guessed correctly. Some of the questions were super easy to answer: “What would your husband say is his favorite TV show?” (Survivor). Some were ridiculously hard: “What was your wife wearing on your first date?” (Unanswerable, since we disagree on what was our official first date). And some were just to hard to only give one answer to: “What would your wife say is the nicest thing you did for her this week?” (Toss up: he made the bed and surprised me with a frozen coke). A few of the cards were romantic in nature, asking about who made the first move (me) and where we had our first kiss (my mom’s van). It was fun to see how much we remembered and how many of our answers were correct – I think if we had kept score it would have been pretty even! Sooo cute!!! What a fabulous idea!!! 🙂 🙂 Sounds like so much fun!! Well Dang! Had I known that the old van was sentimental to you (and Jay), I would have sold it to you! LOL! HAHAHAHA!!!! It’s definitely a happy memory! The funny thing is, you guys and Kevin were in the car too!